A common belief among the major religions around the world is the existence of a personal spiritual guide assigned to each person at birth. The mission of this supernatural being is to protect us and relay our prayers directly to God. This Guiding Spirit is universally known as the Guardian Angel. Your Guardian Angel is by your side waiting to hear from you, wanting to help you. But he may have been waiting in vain if you have never learned the proper way to contact him, if you never learned the secret. Let this powerful amulet help you contact him. How can you summon your very own Spiritual Guide? This powerful and mystical amulet may help focus your attention on your own, personal spiritual guide. 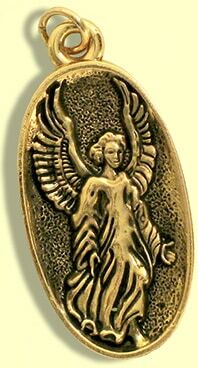 As soon as you receive your Guardian Angel Amulet, a powerful new force may enter your life. You may immediately begin to feel his presence, and his positive influence upon your life. Just as you keep images of your loved ones near you, you should also always be near your Guardian Angel Amulet. Wear it, carry it with you, or keep it in a quiet place in your home. Whenever you have a special prayer, request, or wish, focus your mind directly upon this remarkable amulet and speak your thoughts aloud. As soon as your Guardian Angel hears you he could immediately begin to work on your behalf. Exquisitely finished in 14-karat gold, your Guardian Angel Amulet could instantly become one of your most cherished possessions. Now you may discover for yourself the peace of mind and happiness that comes from knowing that your spiritual guide is right by your side and that your prayers are no longer falling upon deaf ears. Last year, I sent for the Guardian Angel. After I received it, I hit the lottery three times–twice for $500 and once for $250. I had kept the medal put away until today! I took it out and said what I would like. This evening I hit the lottery for $500 again! Thank you! The Guardian Angel does work in mysterious ways. I’ve been feeling better all around. Thank you! I got this Guardian Angel and it is the best thing ever. I feel protected and safe. You really can feel your Guardian Angel next to you helping you. I really recommend this amulet to anybody who needs hope. If you are down on hope and luck, get the Guardian Angel amulet and watch your life be changed for the better. Everything goes from bad to fantastic. Can’t go wrong with your own Guardian Angel on your side!!! !